Benefits provided by AM are perfectly suited to aerospace so it’s no surprise that the aerospace industry has been an early adopter. A precedent has been set by GE that AM is fit-for-aerospace with the joint FAA/EASA certification of the fuel injector for the leap engine. The supply chain is taking note and HiETA is assisting Tier suppliers in both heat management and light weighting developments. Our technologies at HiETA are applicable, amongst other things, in oil cooling, environmental conditioning systems, electronics cooling, fuel cell cooling, hydraulic systems and lightweight structures. The introduction of gearboxes to turbofan engines has meant that waste heat created is now excessive for use elsewhere on the aircraft. 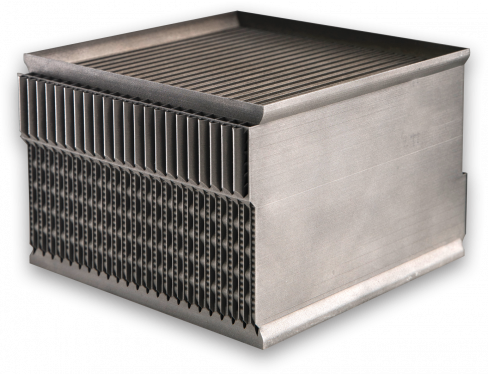 Dedicated cooling schemes are now required demanding lightweight and high-performance solutions, often in areas where space is at a premium. Our range of proprietary heat transfer surfaces lend themselves to these situations where a heat exchanger can be made to be very small and light and packaged in awkward non-uniform spaces. Of critical importance is air-side performance so that pressure drop is minimised which together with ultra-low space claim help to minimise additional drag. To achieve this, HiETA has developed proprietary methods involving selection of machine hardware, process parameters, data handling and non-specific design tools that push Additive Manufacturing technologies to unprecedented levels of feature resolution. Environmental conditioning systems also take advantage of these techniques to ensure high performance on both the hot and cold side of heat exchangers. Shape optimisation techniques ensure that heat transfer surfaces are perfectly optimised for such high mass-flow applications. Shape optimisation is also used to identify optimal geometries for low-mass flow application such as electronics cooling. Studies have shown that heat rejection can more than twice that of current state-of-the-art solutions, for a given weight and volume, used in airborne applications. Our technologies applied to automotive fuel cell applications are anticipated to be relevant to aircraft fuel cells in replacement of the Ram Air Turbine. Specifically, we have developed an evaporating-condensing system for use in proton exchange membrane fuel cells, previously used in aircraft fuel cell demonstrators, that offers impressive performance versus the competition. Our expertise in fluid modelling and pressure drop minimisation are applicable to aircraft hydraulic componentry such as manifolds. Weight saving of 20-30% are possible as well as reduced costs and lead time when levels of geometric complexity are high. Finally, we have helped customers with classical topology optimisation applied to Additively Manufactured parts. As well as running industry standard Altair HyperWorks tools we are able to assist with often less-familiar design for Additive Manufacturing stages to ensure a cost-effective and reliable outcome.